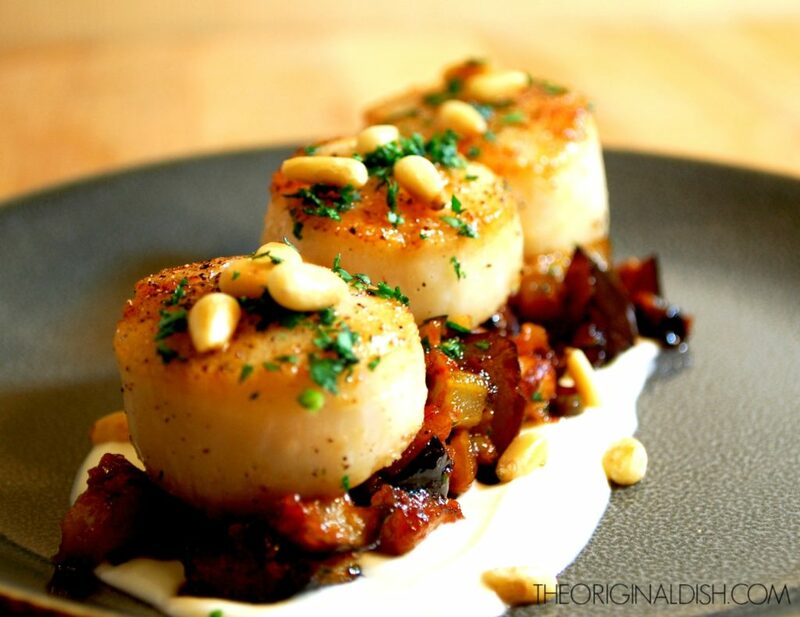 Perfectly seared… Golden crust… Buttery and mouthwatering… I’m talking about scallops! 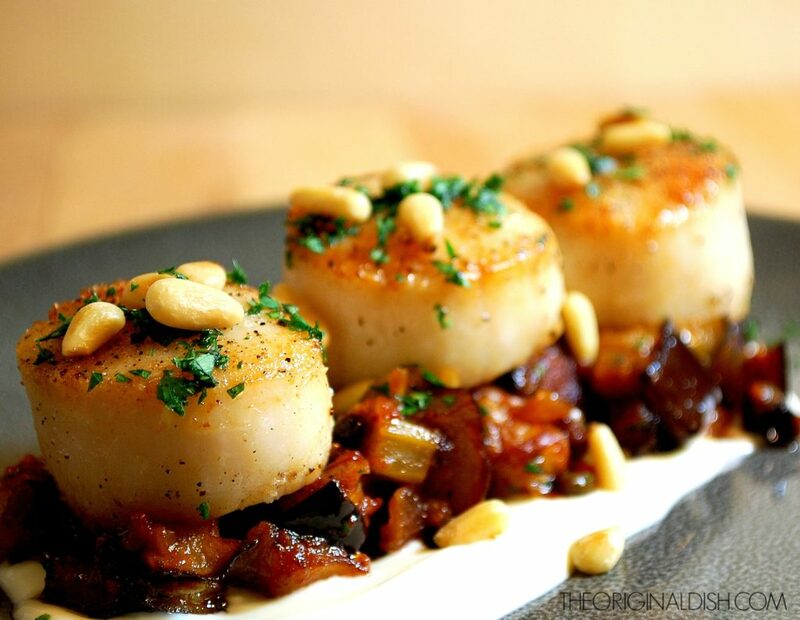 Scallops are my absolute favorite kind of seafood, and quite possibly my favorite food to eat, period. There’s something about their smooth texture and rich flavor I cannot resist. The best part about them? They’re prepared best by doing not much at all. Simple seasoning, sizzling hot oil, a few minutes on each side, and they’re done. To give the scallops a ton of flavor, I make Caponata to serve with them. Caponata is a traditional sweet and sour Sicilian dish. I sauté celery and red onion until they are soft and just beginning to brown. Tomato paste adds a deep tomato flavor while crushed tomatoes give the dish some body. I add in olives, currants, and capers to give the dish complexity with both salty and sweet flavors. To add to that combination, I use vinegar and sugar in the dish, along with some crushed red pepper for heat. Fried eggplant and fresh herbs give the finishing touch. All of these components combine into a wonderfully rich, tangy addition for the scallops. I plate the dish with crème fraîche to give a neutral base for the rest of the flavors. Toasted pine nuts on top for a little crunch, a sprinkle of parsley, and you’ve got yourself a meal! In a 12” sauté pan, heat the olive oil over medium-high heat. Toss the eggplant with enough flour to coat each piece, shaking off any excess flour. Working in batches, fry the eggplant in the hot oil, about 4-5 minutes, stirring occasionally. 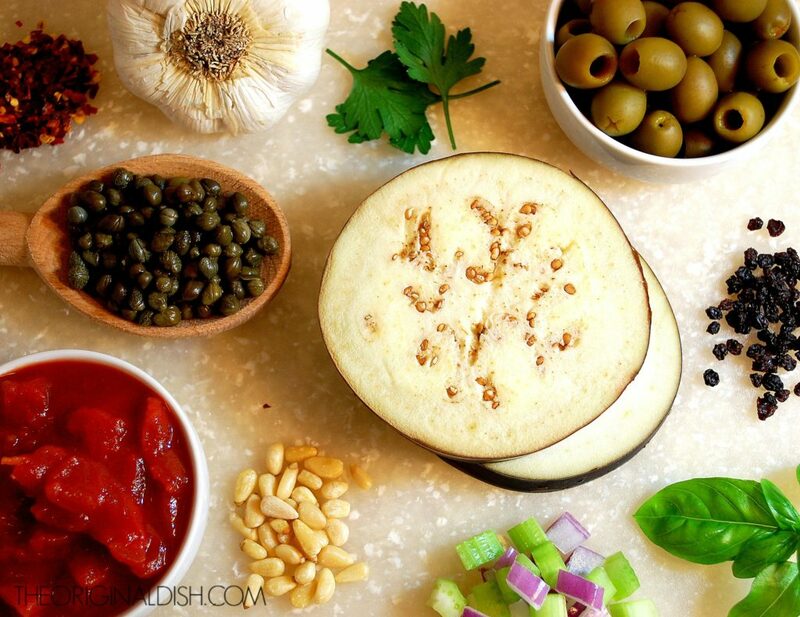 Using a slotted spoon, remove the eggplant to a plate lined with paper towels. Season with salt immediately and set aside. In a medium sauté pan, heat the olive oil over medium-high heat. Add the celery and red onion to the pan. Season with salt and pepper, and cook until the vegetables have softened and slightly browned, 8-10 minutes. Add the tomato paste and cook for about a minute, stirring the paste so it caramelizes. Add the crushed tomatoes and cook down for about 5 minutes before stirring in the olives, currants, capers, white wine vinegar, sugar, and crushed red pepper. Cook until the caponata has thickened, about 12-15 minutes. Add the eggplant to the pan and heat through. Stir in the fresh parsley and basil at the end. Meanwhile, pat the scallops dry with a paper towel. Season each side with salt and pepper. Heat the olive ol in a large sauté pan over medium-high heat. When the oil is hot, add the scallops (you want to hear a sizzle). Sear one side until a golden crust has formed, about 3 minutes. Turn the scallops over and add the butter to the pan. Finish cooking while spooning the butter on top of the scallops, about another 2 minutes or so. Spread the crème fraîche onto a plate. 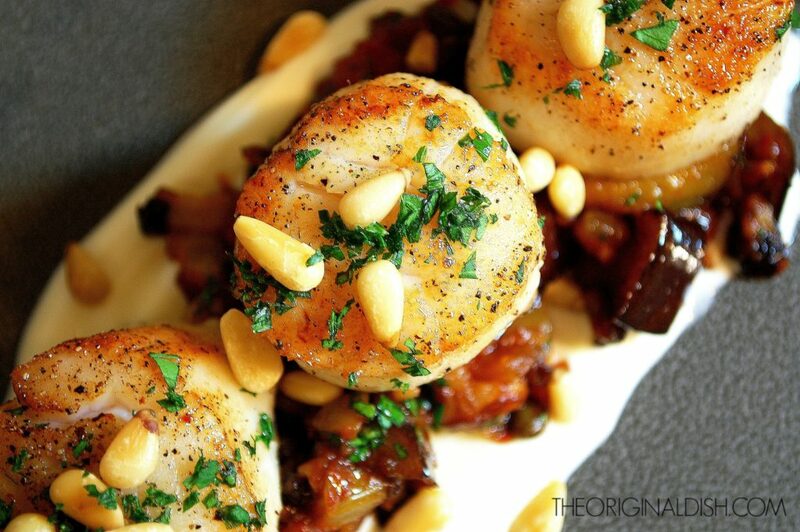 Spoon the eggplant caponata over the crème fraîche and place the scallops on top. 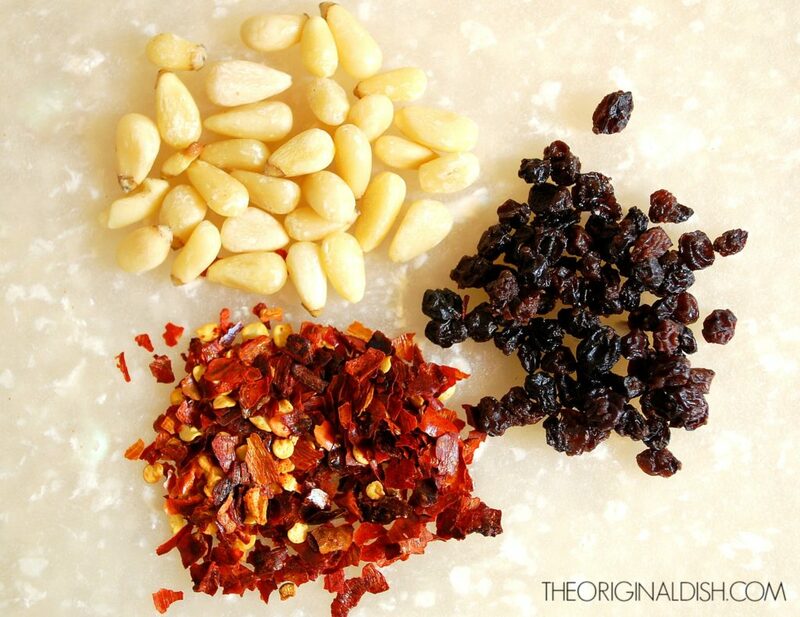 Garnish with toasted pine nuts and fresh parsley. 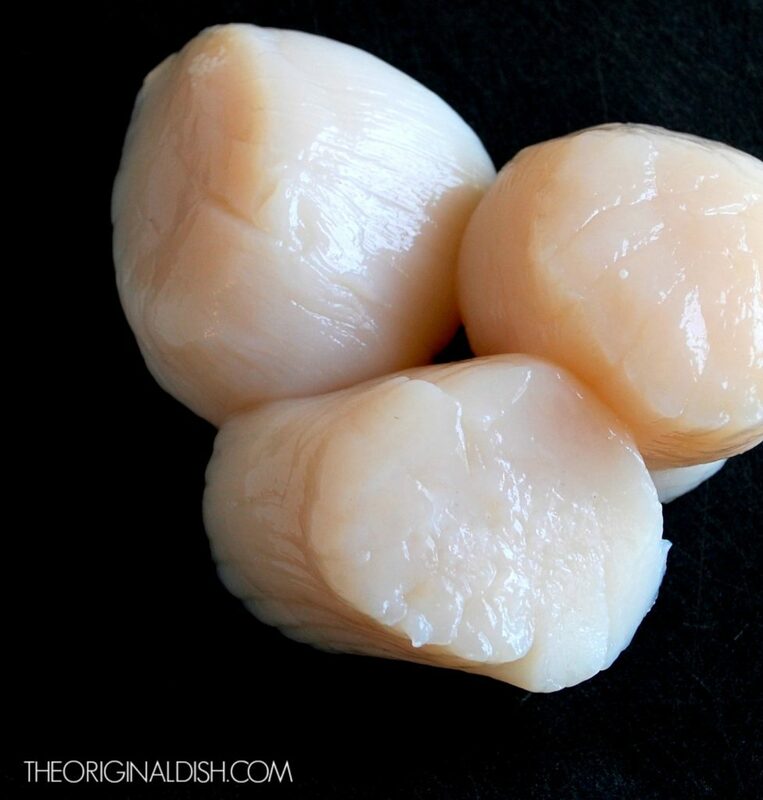 Some of the scallops will have a tough, outer side muscle, so go through each one before cooking them. You can easily remove the muscle by peeling it off. When cooking the scallops, be sure not to overcook them, or else they will be chewy and rubbery. Honestly a spectacular recipe! Great directions as well! Made it last night and thoroughly enjoyed every bite. I’ll definitely be a returning visitor for additional recipes! Thanks! Thanks so much for the great feedback, Steve!! Glad you liked this one…it’s one of my favorites. Honestly a great recipe! Made this last night as my first meal from Original Dish and everyone thoroughly enjoyed every last bite! I’ll definitely be a returning visitor for more recipes, Kayla! Thanks again! Thank you so much!! Love the feedback and really glad you enjoyed it. Hi Linda, this serves 4 people. I hope you enjoy it and happy holidays! Is the eggplant caponata serve hot or room temp. I was thinking of making this ahead of time. You can serve it either hot or room temp! You can definitely make it ahead of time, store it in the refrigerator, and then let it sit at room temperature for about 30 minutes before serving. Or, you can even heat it back up in a saucepan before serving if you’d like. Total preference! The dried current and white wine vinegar are they both 1/4 of a cup it doesn’t say. Thanks for catching that. Yes, they both should be 1/4 cup. Just updated the recipe! Kayla, I am making this for Christmas. Just wondering if I can make the caponatas ahead of time n then reheat it. What are your thoughts? Hi Linda, my other response should answer this. 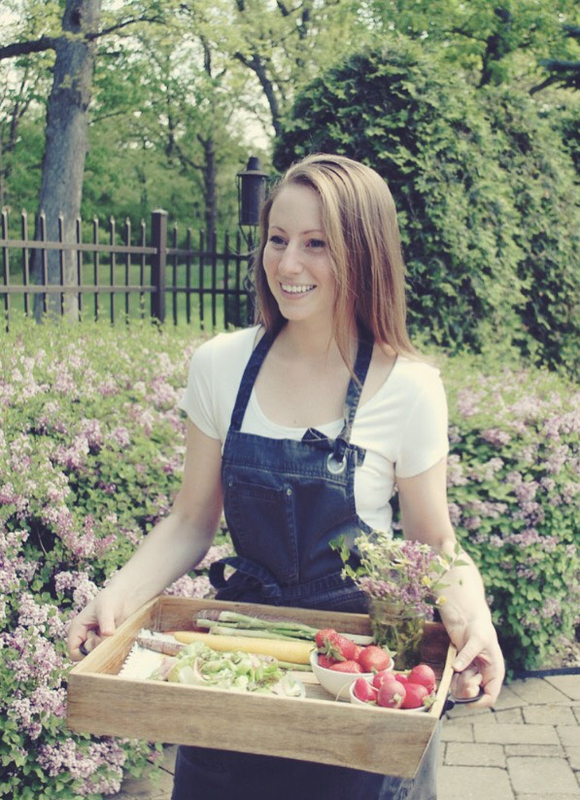 Let me know if you have any other questions, and I hope you absolutely love this recipe! Merry Christmas to you!